The app allows users to "play" choose-your-own-adventure stories in a variety of themes. 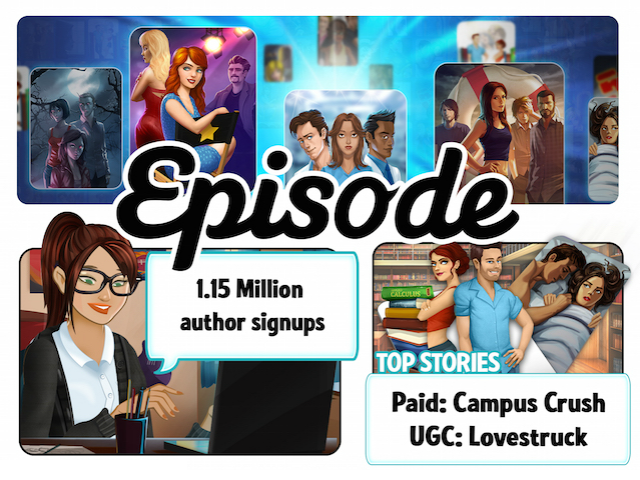 Just over one year ago, Campus Life developer Pocket Gems released its interactive mobile story platform, Episode. The app allows users to engage with a variety of “choose-your-own-adventure” style stories, and it’s a setup that’s been popular with users, as over 450 million total chapters have been read by the app’s community. Episode’s stories deal with survival, romance, betrayal and other dramatic or even sometimes light-hearted themes, and the app goes one step further, allowing users to signup for the chance to create stories for other users to read. Over one million users have signed up to create stories for Episode. Pocket Gems has given us an exclusive first look at the app’s anniversary infographic, which reveals some additional stats about the platform. For example, users are averaging four sessions per day, with romance being the number one genre for both paid and free stories, followed by drama and fantasy. Episode is available to download for free on the iTunes App Store, Google Play and the Amazon Appstore. For even more on the app, check out our interview from the app’s launch.